1906. 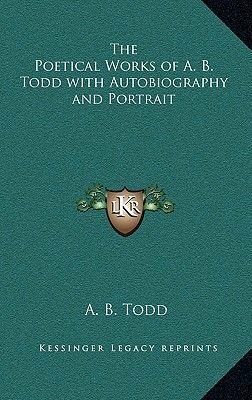 A collection of verse from Todd who writes in the Preface: It may be that others will take an interest in, and read with some degree of pleasure, the reminiscences of one who all his life, and even yet, at the age of fourscore and four years, has had deep and strong poetic feelings and sympathies; one who has been intoxicated with the beauties of nature, and who has written much both in poetry and prose; who has reached his diamond jubilee as an author-having published a volume of poems in 1846-and who has been a journalist for the long period of sixty-two years. If the reader receives but half the pleasure from the perusal of the following pages that I have had in writing them-particularly the autobiographic portion of the volume-then this circumstance will add greatly to my own pleasure, and the volume will not have been written and published in vain.